I used an 11×15 pan and a 6 inch for the top cake.After i baked it using wilton’s cake strips (helps the cake bake evenly) and let it cool, crumb coat it. 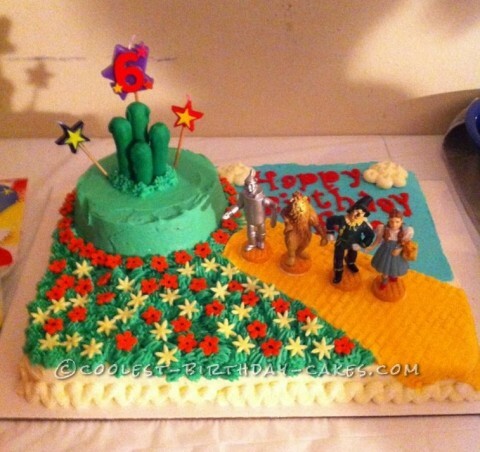 Then section off where the flowers we going to be and the sky part of the cake. Pipe green grass for the flowers using a grass tip, place the flowers on that you have cuts out. Spread the blue buttercreme and pipe the clouds using a # 12, the lettering was done using funky alphabet lower case cutters,brush them with piping gel and added red sugar to make it sparkly (ruby red slippers). I rolled yellow satin ice fondant,used my brick pattern to get the road.My emerald city is big pretzel sticks rolled in green fondant. Those figures were borrowed from a family member but can be bought on ebay. My twins boys yanni and ajani loved it because the love the movie. Fireman Sam vs. Darth Vader – A Mixed Up Cake for an Indecisive 4-Year-Old!